New email only price, no voucher needed this time. 4GB RAM 64GB ROM Dual Rear Cameras Bluetooth 5.0 Fingerprint Recognition 4000mAh Battery. Great price, heat, only problem for me personally is gearbest! Waiting for aliexpress price reductions.. I've received today from them that phone. The whole process took less than two weeks. No customs. Cheapest delivery option. 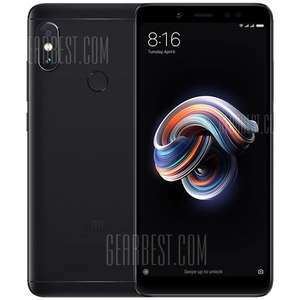 Parcel marked as "mobile with value £15"
i bought the 3GB RAM, 32GB, Redmi Note 5 Global version from aliexpress for £119 on Friday night. Great price, heat, only problem for me personally is gearbest! Waiting for …Great price, heat, only problem for me personally is gearbest! Waiting for aliexpress price reductions..
Just received the 3GB 32GB version from there, happy with service and seller. Read too many horror stories about gearbest that put me off, aliexpress isn't perfect same as anywhere, being akin to ebay, at least there's a bit more accountabilty there as sellers should want to stay in aliexpress' good books, as well as the customers who can rate sellers - little extra layer of protection along with paypal (at least no extra paypal fees with gearbest); who are gearbest accountable to if problems happen? Quite a few people said messages were ignored and they were lied to, can't be fussed with all that. I'm sure people have had smooth experiences with them but I'm not rich/patient enough to not care about the hassle of possible problems. I've had good aftercare customer service using aliexpress when things went wrong. I use gearbest for small purchases. Just received the 3GB 32GB version from there, happy with service and …Just received the 3GB 32GB version from there, happy with service and seller. Read too many horror stories about gearbest that put me off, aliexpress isn't perfect same as anywhere, being akin to ebay, at least there's a bit more accountabilty there as sellers should want to stay in aliexpress' good books, as well as the customers who can rate sellers - little extra layer of protection along with paypal (at least no extra paypal fees with gearbest); who are gearbest accountable to if problems happen? Quite a few people said messages were ignored and they were lied to, can't be fussed with all that.I'm sure people have had smooth experiences with them but I'm not rich/patient enough to not care about the hassle of possible problems. I've had good aftercare customer service using aliexpress when things went wrong. I use gearbest for small purchases. I actually bought this 4GB 64GB version a few days ago when it was posted at around £155. Turned up fine yesterday or the day before. I tend to avoid AliExpress for expensive items as the one time I ordered a GPD Pocket it turned up marked as $100 worth of towels and Royal Mail wanted duties, taxes and a handling fee. Just out of interest, what screen protectors and or cases are people using?